Springs designed for residential garage doors are manufactured in different dimensions and are designed to last for a limited period of time. Average-sized doors use units that last for between four to ten thousand cycles. 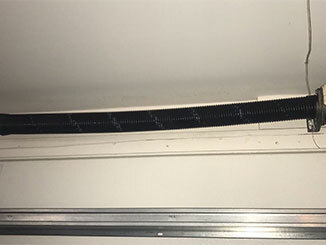 Each cycle represents one full closing and opening of the door, so with the average use being twice a day, that means that the average lifespan of a garage door spring is between five to ten years. This, of course, still depends on how regularly these units are lubricated and adjusted. Garage door springs need to be adjusted from time to time because they lose a little tension every time they move the door. The tension is stored in their coils and is enhanced with the way they are set up. Proper installation and regular maintenance allows them to perform better for a longer period of time and reduces some of the strain they are under, which makes them experience less wear and tear and last longer. Lubrication helps alleviate the friction based wear that affects them, which also prevents them from breaking prematurely due to accumulated damage. Accidents can happen when you try to repair or replace garage door springs yourself without getting help from professionals. In an effort to help customers avoid injuries, our team offers emergency services which aim to provide a same day response to every local homeowner in need. Our experts know exactly how to handle both torsion and extension springs safely, and without putting themselves or you at risk. Speaking of which, did you know that different doors use different types of springs? The extension based units are used for garages where there isn't enough headroom space available to install a torsion unit. They are set up in a pair, one on each side of the door, and they work by stretching to become loaded with tension, and contracting in order to bring the door panels up. Torsion springs, which are the newer of the two, are strong enough that usually only a single unit will be required. They are set up above the door, across a metal shaft which rotates and winds them with tension. That tension is then conveyed to drums which pull lift cables that connect to the bottom of the panels, and that's how the door gets pulled open. Garage door springs must be measured accurately before new ones are ordered. Due to their task of counterbalancing the weight of the panels, it's very important that only the most suitable units are used. For this reason, we suggest that you contact our team at Garage Door Repair Kissimmee whenever you find yourself dealing with a problem related to these components. Our broken spring replacement experts will be more than happy to handle everything for you. Call us today.